Rochester sidewalks just got a little more musical thanks to Pianos for Peace, a new outdoor music installation. Starting this week, 10 pianos will be placed around the City of Rochester for free and public use. Taking music beyond the concert hall and into the public for all to share: that was the goal of senior Eastman music theory major, Marissa Balonon-Rosen. Her project is called Pianos for Peace, where 10 donated pianos will find a new home on Rochester city sidewalks for a three-week long outdoor piano exhibition. Some pianos have already been relocated to the street, thanks to volunteer workers from a local moving company that began installation early Monday morning. In fact, most of the parts to this picture came from material donations by community members and local organizations who want to get involved. That was something that surprised Balonon-Rosen. “I was amazed at how much support was shown to me. Just from all of the different community organizations that wanted to be a part of this, and were willing to host pianos. And all of the people who donated pianos and we got art supplies donated from paint brushes, moving companies to help move the pianos. It's just amazing to see the whole community come together for this awesome outdoor peace and art project,” Balonon-Rosen said. Peace is another theme running through this project. 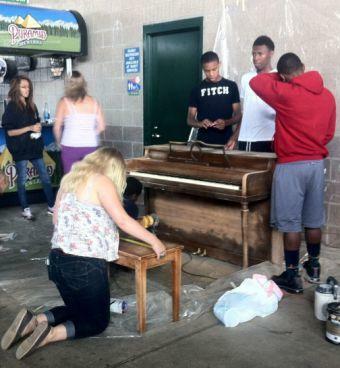 The pianos are scheduled to be painted with peace designs, and work has already begun on the piano at Frontier Field. A group of students began painting this week using a custom phoenix design by SPARK Rochester student, Lamont Adams. "This particular design is more of a goose type shape, but the wings are more broad like an eagle. So the wings are very very large, and very vibrant, with a reddish type, orangish type texture to it, while the body is a bluish, like ocean type,” Adams explained. Adams was supervised by local artist Allison Nichols, who was eager to draw out creative instincts from the students. Pianos For Peace is continuing outdoors for another three weeks before moving to the Gandhi Institute in Rochester, where all 10 will become a Piano Park exhibition with lectures on peace and free piano lessons. To find a piano near you, visit the Pianos For Peace event page on Facebook.